When’s that baby due? Should you move before or after? Timing is one of the most important and most difficult parts of moving. If you’re expecting a new addition to the family, it can make the decision of when to move even harder. There’s pros and cons to both sides, but if you’re still unsure about whether to move while pregnant or after the baby is born, here are three considerations to help you decide. Do you have room in the budget to hire someone to help you clean, pack, move and unpack? Or are you willing to hire a nanny to watch the baby during the transition? If the answer is yes, the timing of the move really comes down to personal preference. If you’re working within specific financial parameters, however, it may be better to move after the baby when you’ll have better range of movement and won’t have to worry about doing lots of bending, stretching or heavy lifting. Everyone loves a newborn, and if you’re moving close to friends and family, you may find yourself overwhelmed with offers to help with the baby. If you have a strong support system of loved ones who can come and watch the baby while you tackle the moving to-do list — or even better offer free help with cleaning and packing — it may be easier to move after the baby is here when you’re not feeling as much pressure and can take your time deciding on just the right house. If you’re leaning toward this option, keep the recovery process in mind. Giving birth and taking care of a newborn is no joke, and it can be hard to evaluate things clearly when you’re mentally and physically exhausted. No two moves are alike, and what worked out for your best friend or sister may not be ideal for your situation. Think about any other issues that may factor in. If you’re lease is expiring or you’ve sold your current home, you may not have time to wait even if you want to. If you’re moving into your forever home, you may want to brave moving post-baby so you don’t have to settle for less than perfect when house shopping. 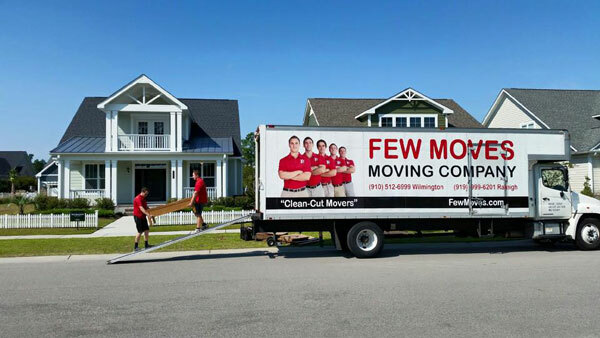 No matter what you decide, Few Moves Moving Company can help. A Wilmington, NC, moving company, we get you settled in your new place quickly so you can start enjoying the next chapter of your life.